Wir haben unseren Urlaub Ende Juni / Anfang Juli sehr genossen! Das Ferienhäusschen bietet alles was man braucht, die Bilder und die Beschreibung stimmen exakt mit der Wirklichkeit überein :-) . Der Garten ist herrlich, besonders haben wir uns an den vielen Blüten und Blumen erfreut. Den Pool haben wir gerne genutzt, durch eine intelligente Abdeckung bleibt er stets wunderbar warm. Man kann vor und hinter dem Häusschen wunderbar draußen sitzen und sich so Sonne und Schatten aussuchen, wie man es gerade möchte. Für uns war auch der Standort sehr gut, denn so konnten wir in jede Richtung wunderbar Ausflüge unternehmen. In einer dicken Mappe waren auch jede Menge Tipps für Restaurants und Ausflüge. Danke an Nicky und Phil für diesen idyllischen Urlaub! We spent two weeks in the "Little House" at the end of May 2018. This is definitely the place to be if you seek relaxation as well as adventure. Relaxation you get by enjoying the beautiful garden, by listening to bird concerts (the nightingale beats them all), by watching butterflies during the day and deer at nightfall, by taking a dip into the pool once in a while or by just lying on the deckchairs provided for, reading and getting a nice tan. Adventure can be achieved easily as the "Little House" is the ideal starting point for any kind of tour or trip. It is real close to the freeway ramp, but not too close to be bothered by any noise from there. Thus it is always only a rather short distance to the main and minor attractions and sights along the coast as well as to the mountain range and its charming villages. Hiking can be a good suggestion, but check the weather forecast first, as heavy rain with thunder and lightning can approach quickly. Mountain biking is an even better idea. "Normal" bikes can do the job too, but make sure you have a repair kit with you - just in case. Markets and supermarkets are within easy reach as well, so are many excellent and good restaurants. Just rely on what Nicky and Phil recommend. You cannot go wrong then. We have been to many places in the south of France and in Italy; most of them have been great places. But this one beats them all. This has probably been our best holiday ever! Thank you, Nicky & Phil. You have been great hosts. We would love to return some day in the future. Die komplette Ausstattung innen wie außen. Es ist wirklich alles vorhanden, was man braucht inklusive einem Willkommenspaket an Verpflegung (Wasser, Bier, Wein, Saft, Marmelade, Chips, Brot, Margarine....). Der Garten ist wirklich ein Traum und mit Herzblut gepflegt, auf der Rückseite befindet sich noch ein kleiner "eigener" Gartenteil inklusive Grill. Es ist problemlos möglich, einen Tag nur im Garten zu bleiben, zu lesen und den Tag zu genießen. Der Pool ist groß genug, um tatsächlich zu schwimmen und ebenfalls sauber und gepflegt. Das Haus ist sehr ruhig gelegen und bietet sich als Ausgangspunkt für Ausflüge in die Umgebung in verschiedene Richtungen an. Ein Auto ist aus unserer Sicht unabdingbar. Ein Parkplatz unter dem Carport ist vorhanden. Es liegt eine umfangreiche Sammlung an Reiseführern, Ausflugstipps und Restaurantempfehlungen im Haus vor. Nicky und Phil sind sehr herzliche und unkomplizierte Gastgeber mit tollem Humor. Fragen werden immer gerne und schnell beantwortet, man merkt, dass ihnen das Wohlbefinden der Gäste am Herzen liegt. Nicht unerwähnt bleiben sollen außerdem die beiden lieben Katzen, die sich auch mal eine Portion Streicheleinheiten bei uns abgeholt haben (vor allem Tabby :-) ). Bedingt durch die Lage wirklich mitten in der Natur gibt es auch eine Vielzahl an mehrbeinigen Zeitgenossen. Es wäre in unseren Augen ein großer Pluspunkt, wenn das Haus mit einigen Insektengittern versehen wäre. Das Bett war uns entschieden zu hart und uns wären zwei getrennte Bettdecken auch lieber als eine große gemeinsame. Das ist aber letztlich Geschmacksache und man kann es nicht jedem recht machen. Unser Gesamtfazit fällt sehr positiv aus und wir können uns gut vorstellen, nochmal einen Urlaub im "little house" zu verbringen. We have just returned from a fantastic stay at 'The Little House', a brilliant base to see the sights of Istria. The cottage was perfect for the two of us, it had everything we needed and was set in their stunning gardens. The pool is a great area to relax in after a days sightseeing. Nicky and Phil are excellent hosts and always on hand for advice on the area, nothing is too much trouble for them even rescuing us after we got lost on the way to them ! 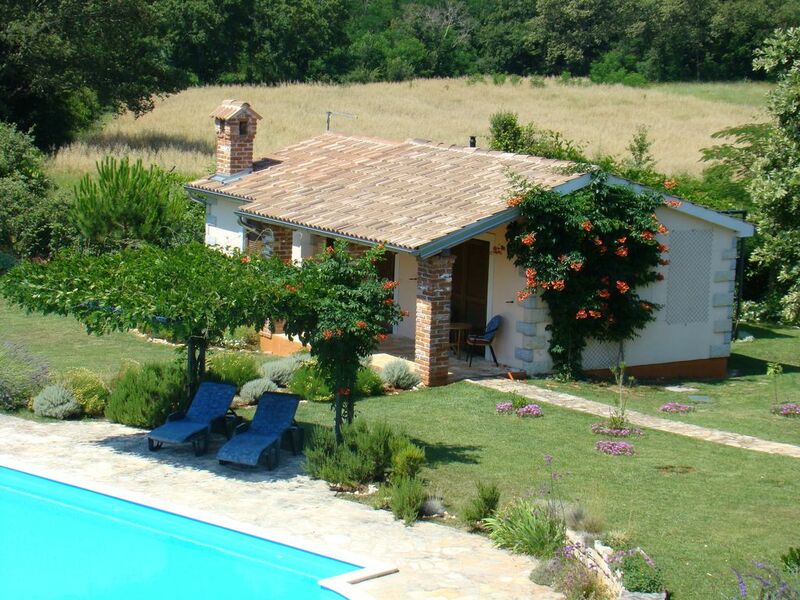 Located in the hamlet of Matulini, the Little House is perfectly situated for enjoying the peace of the Istrian countryside, whilst offering easy access to the coast, tourist attractions and restaurants. Our hosts, Nicky and Phil, have thought of pretty much everything to ensure guests want for nothing during their stay, provided a welcome pack if you hadn't managed to stop off at the supermarket enroute and were always on hand to give tips and advice if needed. The beautiful gardens and the pool were always lovely to come back to at the end of a day's sightseeing in Porec, Rovinj, Novigrad, Vsrar, Motovun or Groznjan. Highly recommended! Preferred changeover day is Wednesday, but arrival is possible any day except Sunday. You should arrange your own cancellation & travel insurance. CANCELLATION POLICY: If you should need to cancel the booking, we will refund monies paid as follows: a. Deposit is always non-refundable. b. If full payment is made on booking and cancellation is more than 40 days before arrival, we will refund all money minus the 25% deposit. c.	If cancellation is 14-40 days before arrival, we will refund 25% of the difference between the full price and deposit*. d.	If cancellation is less than 14 days before arrival, there will be no refund* * If we are able to re-let the house at the same price, then your payment (minus the deposit) will be refunded in total, no matter the time of the cancellation.